Unique among all the National Monuments in the United States, the Craters of the Moon is a landscape of volcanic rock including craters, cinder coves, lava tubes, deep cracks and expansive lava fields. You may think you have landed on a different planet as you hike or drive through the lava flows and unique landscape of this national monument. The Craters of the Moon is located 18 miles southwest of Arco, Idaho on Highway 20/26/93, 24 miles northeast of Carey, Idaho. The Monument and Preserve is open year round. Entrance Fees: Single Vehicle - $10.00, bicycle, motorcycle or by foot - $5.00 per person, age 15 and under – FREE. The Monument and Preserve also accepts four national passports. First designated as a National Monument by President Coolidge on May 2, 1924, the Craters of the Moon has continued to expand through five separate presidential proclamations. Today the monument encompasses nearly 715,000 acres of federal land. Don't miss this strange, unique, and wild landscape. Scientists believe that the Craters started to be formed over 15,000 years ago when the volcanic eruptions began. It is theorized that the most recent eruptions occurred about 2,100 years ago. Nearest airports are located in Hailey, Idaho (60 miles), Idaho Falls, Idaho (84 miles), and Twin Falls, Idaho (90 miles). By car, the Craters of the Moon is 18 miles southwest of Arco, Idaho on Highway 20/26/93, 24 miles northeast of Carey, Idaho. Craters of the Moon Monument and Preserve is open year round. However, heavy snow in the winter prevents access via automobile around the Loop Road from mid-November to mid-April. During the days that the road is open it is open during all hours. The Visitor Center is open year-round from 8 a.m. to 4:30 p.m. daily. From Memorial Day through Labor Day, the Center is open from 8 a.m. to 6 p.m. The Center is closed during Federal Holidays. Now lying dormant the area has become a major tourist attraction, with an excellent visitor's center, and camping facilities. The Monument is managed by the National Park Service and the Bureau of Land Management. Due to the rugged terrain and limited accessibility to some portions of the Monument, it is highly recommended that visitors begin any visit at the Visitor's Center. 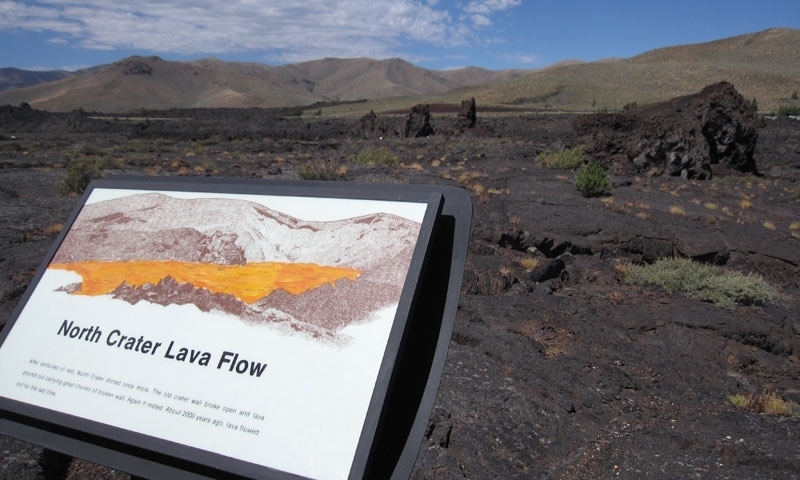 You can sleep in the midst of the lava flow at one of the 52 site campground just past the visitor center. Campsites are available on a first come, first served basis for $15 per night per campsite or $8 per campsite in the early and late season when no water is available. At Craters of the Moon, you can learn about the area from the interpretive exhibits and displays at the Visitor's Center, hike up a volcano, explore lava tube caves, or join a ranger for an interpretive hike. "The Devil's Vomit" is how one Oregon- bound pioneer described his encounter with Craters of the Moon. In 1969 Apollo 14 astronauts including Alan Sheppard, Edgar Mitchell, Joe Engle and Eugene Cernan visited Craters of the Moon as NASA thought that the lava landscape would prepare the astronauts for trips to the moon.